Below are a list of restaurants that serve raw and living foods. If you know of any other resources, please add them! Amazing food and energy. Two locations in San Francisco. One location in Berkeley. Just opened Sept 13th, look for a review soon! Unique gourmet Vietnamese & Chinese Cuisine. Serves 7 course RAW FOOD meals (call in advance). Open Tues-Sun 10:30am - 9pm. Closed Monday. High End Restaurant that serves cooked food as well as a raw dish every night. Live Chef is Angja Aditi, let her know you found out about it from John Kohler. The Tree Of Life Rejuvenation Center has a raw food restaurant open to the public. Fresh foods directly from the garden are served in a delightful outdoor setting connected with nature. Patagonia is approximately 1 hour south of Tucson. Please call for more information and/or directions. Offering gourmet, organic, raw & wholesome living cuisine. webmaster's tip: avoid the pate, and go with the cheeseburger. Call for hours and availability - open seasonally. opening soon. check web site for info. Comment: smoothies, fresh nut milks, juices, raw salads, raw pizza and dehydrated foods. At the raw experience we serve only the finest quality fresh living foods we are all raw all organic all vegan all the time we use locally grown foods whenever possible we produce as little waste as possible we compost and plant many seeds we use creativity , ingenuity, style consciousness, love to make every dish and remember we put the pie in paia. A raw cafe and classes. Open 7 days. Visit web site for information. Delights of the Garden has moved to 2616 Ga Ave., across the street from Howard Univ. 's school of Business and we now feature a cool-looking cafe with raw and cooked vegan favorites. Our sampler platter is a vegan favorite at Delights of the Garden. Also check out our new book "30 Days @ Delights of the Garden"
Raw foodist restaurant serving breakfast, brunch, lunch, and dinner. 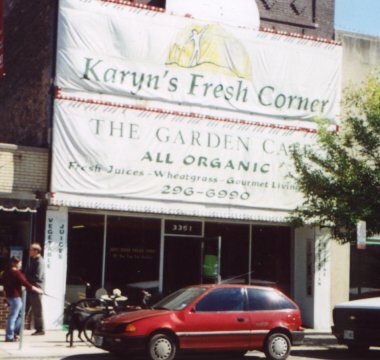 I visited Karyn's Fresh Corner restaurant today, and I was not disappointed. The food was mostly raw and delicious. I also enjoyed my fresh wheatgrass juice and a smoothie. Prices were good and the atmosphere was delightful. Will I return again...you bet your raw food I will. I met Karyn and enjoyed talking with her, exchanging ideas and learning from her. Angel who runs the place, is a really nice guy. They have natural hygiene meetings there. Make lots of good stuff. Not an all raw place, totally vegan restaurant, always have raw available. All raw menu, all organic, salads, fresh juices, soup, guacamole, essene bread, almond shakes, and more! Excellent atmosphere! Salad bar with all organic food. Some raw. Some cooked. Helpful. Get Melvin to make you fantastic juices. Sprout garden, Market, and Eatery. Serving Lunch 10am-2:30pm Monday through Saturday. Suzanne's Vegetarian Bistro in Miami has just added a daily raw soup to their menu, and they will likely have living foods entrees beginning around Jan 2001. Living and Raw foods restaurant. Menu looks really appetizing. Vegetarian cafe - not sure if they have a selection of raw(?) Can anyone confirm? Last time I was there, they did have a juice bar..